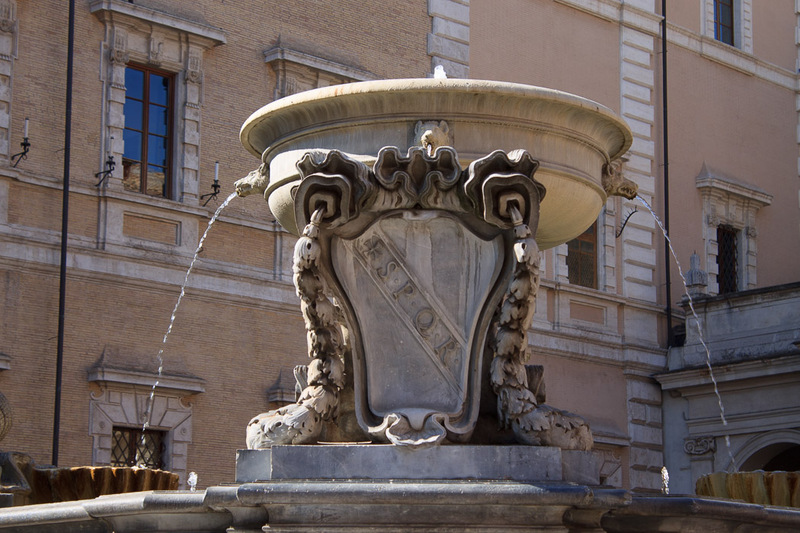 The Fountain in Piazza Santa Maria in Trastevere is located in front of the church of Santa Maria in Trastevere. It is believed to be the oldest fountain in Rome, with prior incarnations of the fountain dating back to the 8th century according to some sources, and even back to the first century BC according to other sources which claim that Augustus had a hand in constructing the original version. The 8th century fountain appears in a drawing on a map of Rome made by Pietro del Massaio in 1471. The drawing shows two bowls, one above the other, pouring water into the basin below. The fountain was reconstructed in 1499-1500 by Donato Bramante, who was hired by Giovanni Lopez, the bishop of the church. Bramante, who was also the architect of St. Peter's Basilica, removed the upper bowl and added the four carved stone wolf heads, the emblem of the Lopez family. The fountain was again reconstructed in 1604 by Girolamo Rainaldi, and again in 1659 by Bernini, who replaced the octagonal basin, moved the fountain from the front of the church to the center of the piazza, and added four outward-facing sculpted seashells around the basin. In the late 1600s, Carlo Fontana replaced Bernini's seashells with his own sculpted seashells which faced inwards. The fountain was completely rebuilt in 1873, following the design of Bernini and Fontana, but using less expensive materials. It was rebuilt once again in 1930. Whew! The Fountain of Ponte Sisto is nearby, as is, of course, the church of Santa Maria in Trastevere. 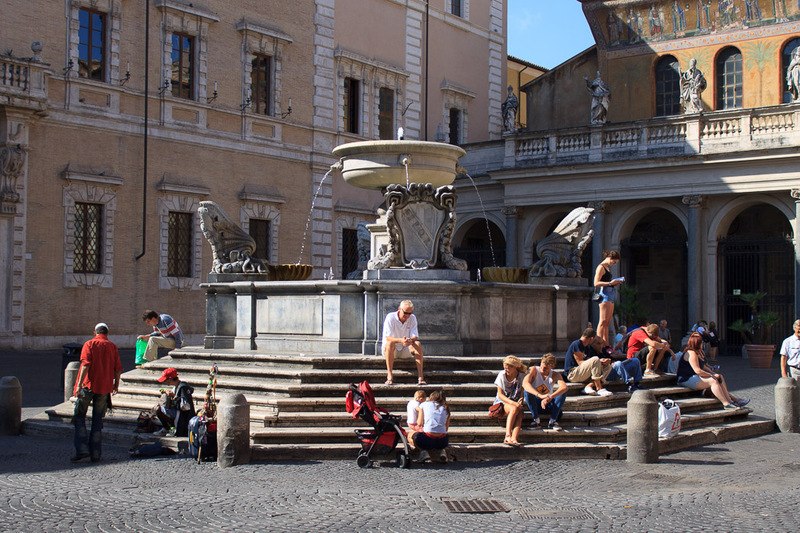 See all Fountain in Piazza Santa Maria in Trastevere photos.